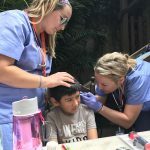 On Monday, June 25, International Medical Relief (IMR) brought a team of 30 doctors and nurses to Escuela Integrada to provide wellness checks, health education and comprehensive exams for those with presenting ailments. 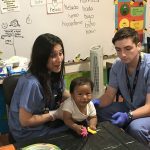 The doctors included a physical therapist, ophthalmologist, gynecologist, foot specialist and pediatrician among other specializations. 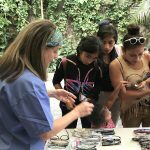 IMR provided the clinics to Escuela Integrada students and families at no cost. “When the children from our school are sick, they can’t go to the doctor. They don’t have the money,” said Bradler Santos, principal of Escuela Integrada, in Spanish. According to Santos, there are six major health concerns for the families from Escuela Integrada. 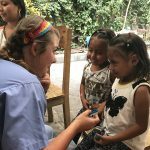 They have problems with their teeth and oral health, and suffer from stomach infections, respiratory ailments, fevers, low vision, and difficulty with digestion due to poor nutrition and a lack of vitamins. 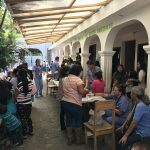 The national hospitals in Guatemala do not have sufficient medicine, doctors or space to care for all the patients who are ill. The IMR team saw 199 patients over six hours, three hours in the morning and three hours in the afternoon. 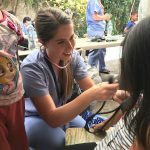 Escuela Integrada students are on break this week, which allowed the team to use the classrooms and common spaces at the school for the clinics. 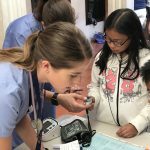 Each patient’s first stop was a triage table where nurses assessed their vitals—blood pressure, body temperature, weight and pulse—and asked them about other presenting problems. If the patients had symptoms of other ailments, they moved from the triage table to one of the examination rooms. 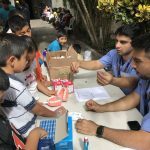 IMR provided a small medical lab for fluid tests and diabetes checks, as well as a pharmacy where patients could fill prescriptions and receive over-the-counter medicines. 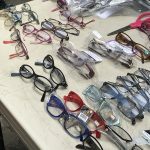 In addition, IMR offered eye exams and reading classes at various strengths for anyone with low vision. A physical therapist was also available to demonstrate exercises and stretches for those with musculoskeletal pain. 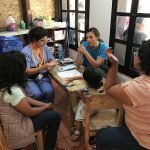 Before leaving Escuela Integrada, all of the patients visited a health education table where they received information about washing their hands, protecting their skin in the sun and maintaining good dental hygiene. Patients practiced brushing teeth and flossing using a 3D model and received a toothbrush and floss to take home. 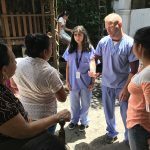 A team from IMR first provided care at Escuela Integrada in January after Amy King, wife of GRACES board member, Kevin King, connected with a trip leader in November of 2017. The IMR team was staying at the same hotel as the GRACES board members during the annual Supporters Gathering. 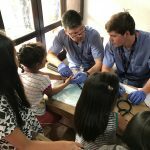 Later, IMR committed to providing clinics at the school two times per year, once in January and once in the summer. 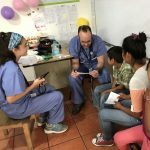 IMR offers short-term and long-term medical mission trips for underserved communities around the world. 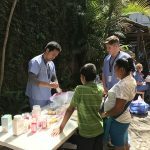 They specialize in mobile medical clinics, sustainable health education and disaster relief. 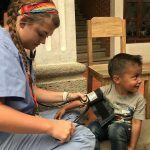 During their time in Guatemala, they will spend time serving communities in need, such as Escuela Integrada, as well as providing acute medical care for the victims of the Fuego volcano eruption. 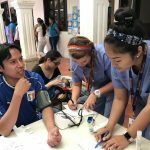 Mynor, a teacher from Escuela Integrada, has his blood pressure checked by a nurse at the triage table. 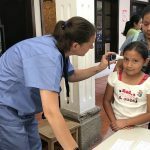 Two IMR practitioners provide additional examination of a child’s ear at the laboratory table. 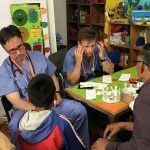 IMR doctors conducted exams for family members of students from Escuela Integrada. IMR doctors met with the families to address presenting ailments. A nurse checks the body temperature of an Escuela Integrada student. Nurses assessed the vital signs of all patients who came through the clinic. An IMR volunteer fills prescriptions for patients who received a prescription from a doctor. 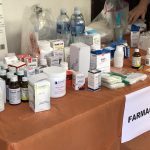 IMR provided over the counter and prescription medicines for patients at no charge. A physical therapist demonstrates stretches to ease wrist pain. 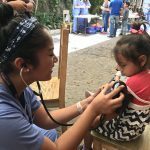 The IMR clinic was held at Escuela Integrada because school is out of session for the week. 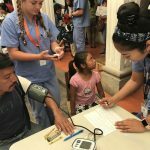 A nurse checks the blood pressure of a student from Escuela Integrada. Going to the doctor can be fun! The nurses made people of all ages feel welcome and comfortable. Reading glasses were provided for anyone who had trouble seeing. Eye exams were conducted to determine the strength needed. 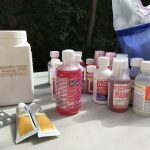 IMR brings their own pharmacy to clinics to provide medicine at no cost to the patients. Nurses check the pulse and blood pressure of a father and daughter at the triage table. A physical therapist demonstrates strength-building exercises for a patient. 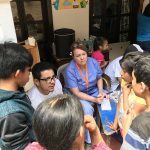 Doctors examined previous surgeries and complications for patients who received care elsewhere in Guatemala. A foot specialist met with patients to discuss specific foot ailments. A pediatrician was available to asses the needs of the youngest patients. Two girls visit with a nurse at the triage table before being seen by the doctors. A doctor provides an eye exam and reading glasses for patients who had trouble reading. 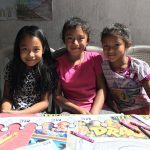 Three Escuela Integrada students color while they wait for their exam. 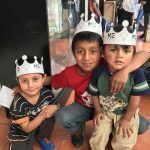 A family of young boys shows off their crowns while they wait to see a doctor. A nurse listened to the heartbeat of a young patient. Patients check in at the registration table before being seen by nurses and doctors at the clinic. Two IMR practitioners demonstrate how to floss your teeth and the health education table. A doctor and his assistant review the presenting ailments for a family. 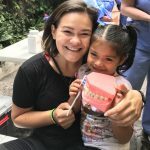 Escuela Integrada volunteer, Piper Mik, helps a student know how to brush her teeth using a 3D model.